I am currently travelling around the world with my wife and 2 young sons, exploring new places and writing books along the way. We found out in January 2012 that our 3rd son Trek Atlas had a rare genetic disease called Niemann Pick Type A. There is no treatment or cure, Trek died in our arms on June 21, 2012 after getting 4 stamps on his passport. You can read about his travels and life here. Our life will never be the same without our sweet boy-we are continuing our journey around the world in order to celebrate every day of his life. My wife and I made a decision at the end of 2011 to travel the world. In the begriming of 2012 we were going to Thailand to spend more time as a family, enhance the boys education, and to see the world. When we received Trek’s diagnosis in January we decided we still needed to show him the world. We traveled to Nicaragua, Honduras, California, Texas, Maui, Japan, and Thailand with Trek. It was magical. In the months since Trek’s death we have also been to Laos and Burma. 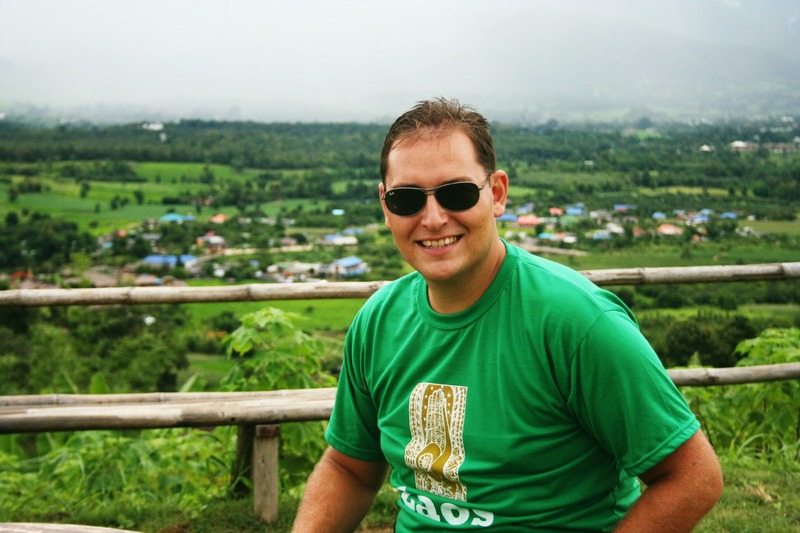 We are currently in Pai, Thailand renting a house finishing my book Following After Trek available in November 2012. You can read more about our family travels and Trek’s journey on my wife’s website-www.oursonnylife.com. Chelsea: My wife, she is a mix of Mary Poppins and Betty Crocker. After Graduating Liberty University, she has become a stay at home mom and official unschooling teacher of the Ingram house. She is passionate about parenting and is the most wonderful mother alive. She has managed to stay married to me over the past eight years and has been my best friend through it all. I cant imaging going through the journey of life without her as a partner. No matter how high or high low I have been emotionally she has always believed in me, and somehow, after all this time, she still likes me. For that I am grateful. She has her own blog that you can read, it’s can be read at www.oursonnylife.com. The only difference between hers and mine is that people actually read hers. Peyton: Oldest of my three sons, he currently is six years old. He loves to climb and frequently scales anything within his vision. Height is of no concern for him nor footholds. If it’s vertical, he can scale it. He is the sweetest boy you could ever meet and Chelsea and I have only been concerned because he doesn’t ever do anything wrong. The other day we found out he would sneak cokes from the fridge when Chelsea would put the baby to sleep, imagine our relief! He is sarcastic and witty, willing to forgive anyone who wrongs him and the shinning example of what a human being should be to his younger brothers. I am proud and fortunate to be his dad. Conner: Power personified is this young man’s persona. He currently is four years old and I am glad that I am in with him because he is not to be trifled with. He is passionate in both anger and love. Without question, he is the sweetest older brother to baby trek and does things like bring him toys and sings original songs to him. He is sharp and perceptive and I highly doubt that anyone in his life will ever be able to take advantage of him or those he cares about. He is the protector of our family while at the same time the lover of the family. His equally tender side gives context to his power and crystallizes why he is so passionate in all he does. I am proud and fortunate to be his dad. Trek: April 11, 2011-June 21, 2012. He entered the world in the natural way. No hospital required for this little adventurer. Only a mother, a driveway, and a dad for the doctor. You can read his driveway birth story here. Needless to say, he has the most beautiful blue eyes that are always open. I choose to see it as a symbol that he is aware and sees things for what they are. In truth, he has the island vibe big time and is disinclined to raise so much of a finger to do anything. He is happy and chill andlived all his days enjoying the beauty of this world and the love of his family. I am so sorry to hear that you are going through such a difficult time. Know that you are loved and cared for by many and that, even more important, Trek is too. I am praying for you, Trek, and your family. Thank you for sharing from your souls on such an intimate path with precious little Trek. I am so sad that you, Chelsea, Connor and Peyton have to travel this way. Thank God you are making the choice to treasure all of the moments as you are. Your Great Grandma Betty is my Aunt Betty (married to Uncle Bob Morgan) and that is how I found out about what you all are going through. She shared it with my parents who put it out there so we can all join in supporting you. Are y’all still going to go to Thailand? What kind of books are you writing? My family and I have been keeping yours in our prayers. I am writing 3 books. 2 of them are fiction novels that I would categorize in the conspiracy theory/suspense vein. The other is a book about how to follow you dreams. Thanks for the positive thoughts about my family. A young friend of mine just lost her beautiful 3 year old daughter after a year of fighting cancer. I think Maddison and Trek passed around the same time. They are two beautiful angels and I hope they meet and carry on their awesome legacy of love! Hi Jarrett, we are so very sorry about the loss of Trek. He was a precious blessing. We know what it is to loose someone you love. You might remember that Debbie had three younger brothers: Jimmie died in 1991, John died in 2008, and my last little brother Rick died in July 2012. While it has been very hard I know that God is with us and understands how we feel; God’s Son died on a cross for our sins. We love you all and are praying for you and your family. One can only imagine the pain of losing a child… I am deeply sorry for your loss. I would never dare to say that this is the kind of pain that goes away with time, but I admire you and your family for choosing to treat the wound with love and willing to live life at its fullest. I strongly believe that in heaven Trek could never feel pain or sadness or sorrow; but seeing you guys live in love and to love must make his bright blue eyes shine like a million stars and his smile could not be any bigger. Thank you for sharing your story, and in such an inspiring way.